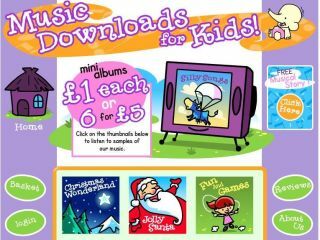 MusicDownloadsForKids.com is a new online music store aimed at young children and their parents, filled with fun tunes. Launched by veteran children's music composer Roger Wade, the self-proclaimed 'iTunes for kids' aims to get children into music, as well as teach them good net practices at an early age. "Many of us would rank music as one of life's greatest pleasures. Now our children can appreciate and enjoy music from an earlier age," said Andrew Borek, director of the site. The brightly coloured site offers five-track mini albums, in MP3 format, for £1 and six mini albums for £5. Among the songs available for the target audience of 2- to 4-year-olds are original hits like Santa Loves to Boogy, I've Never Seen a Cricket Bat and Jibbering Jackass. There are also covers of classic tunes, and educational tracks. The site hopes to expand to include more educational material in the near future.